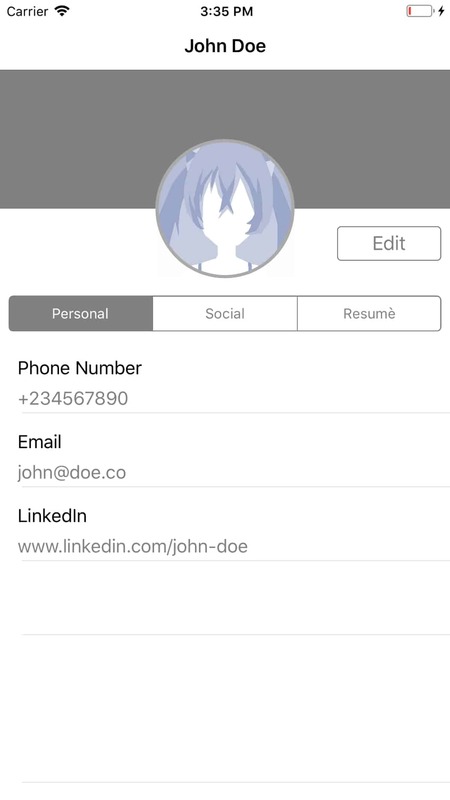 In an app like this, you’ll probably want a navigation bar so that a user can navigate from the list of contacts to a detail view for a certain contact and then go back to the list. A UINavigationController would easily solve this with its navigation bar. A UINavigationController is simply a stack on which you push many views as you go further into the application. The upper most view (the one pushed or navigated into last) is probably the one that the user sees right now (except if you have another view presented on top of that). And as you push view controllers on top of the navigation controller, a back button will be automatically be created by the navigation controller (the upper left or right side depending on the device’s current language preference) and pressing that button will take you to the previous view controller. All of this is handled, out of the box, by the navigation controller. And adding one to your application would only take one extra line of code (if you don’t want customizations to the navbar). And now change self.window?.rootViewController = viewController to self.window?.rootViewController = navigationController. 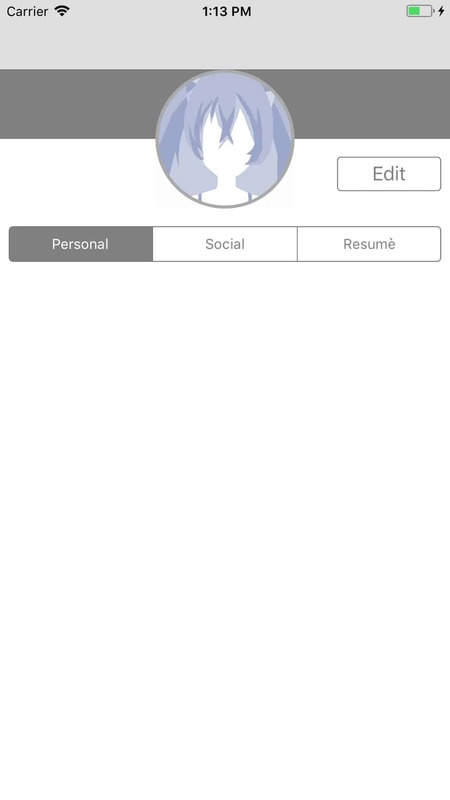 What we did in the first line is create an instance of a UINavigationController and give it our viewController as the rootViewController, which is the view controller at the very bottom of the stack, meaning that there will never be a back button on that view’s navbar. Then we give our window the navigation controller as it’s rootViewController since it will now contain all of the view in the application, or that tab if that app has a tabbar. Increase the size of our upperView to accommodate the navigation bar’s height. Set the navigation bar’s isTranslucent property to false. Doing this will make the navigation bar opaque (in case you didn’t notice, it is a little bit transparent) and now the superview’s top edge will be the bottom of the navigation bar. 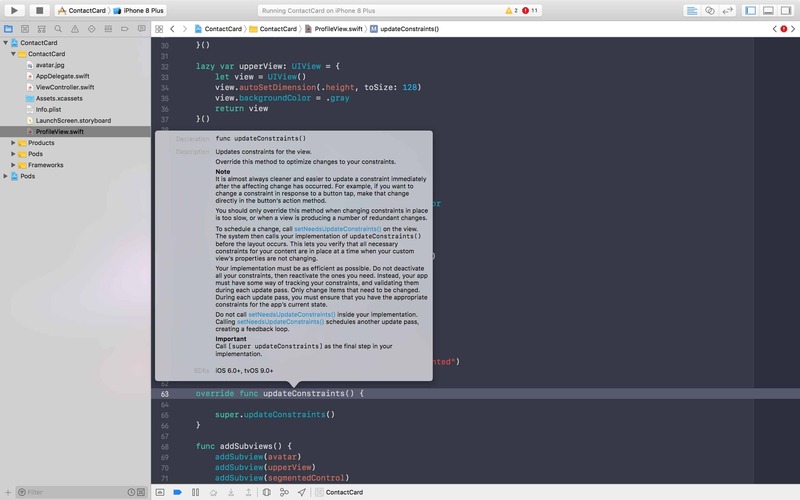 Before proceeding, we’ll need to slim down our ViewController.swift file to be able to only accommodate actual logic instead of just code for UI elements. We can do this by subclassing UIView and moving all of our UI elements there. The reason why we’re doing this is to follow the Model-View-Controller architectural pattern, or MVC for short. More on MVC Model-View-Controller (MVC) in iOS: A Modern Approach. And now we’re ready for refactoring. Cut and paste all the lazy vars from the view controller to our new view. Below the last lazy var, override init(frame:), by typing init and then choosing the first autocomplete result from Xcode. You can fix this by clicking on the red circle and then Fix. In any overridden initializer, you should almost always call the super class’s initializer, so add this line of code at the top of the method: super.init(frame: frame). Cut and paste the addSubviews() method underneath the initializers and remove the self.view before each addSubview call. For the constraints, override updateConstraints() and add the call to its super at the end of that function (where it will always stay). Now go back to the view controller and initialize an instance of ProfileView above the viewDidLoad method let profileView = ProfileView(frame: .zero), add it as a subview to the ViewController’s view and pin all its edges to the superview’s edges. 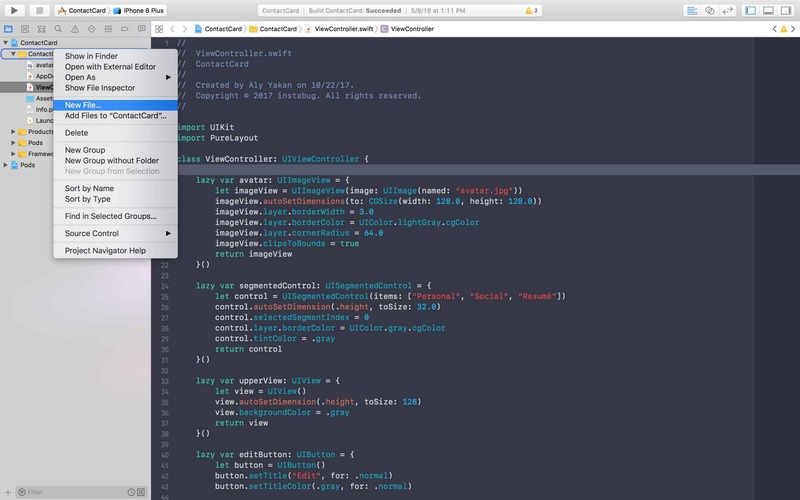 Now our view controller has slimmed down to just a few lines of code after being 100 lines long! To make sure everything’s working as intended, run your app and check how it looks. Now everything doesn’t just look good, but also its code belongs where it should be. Having a slim, neat view controller should always be your goal. It might take a little bit more time to do so, but it will save you so much hassle later on during maintenance. 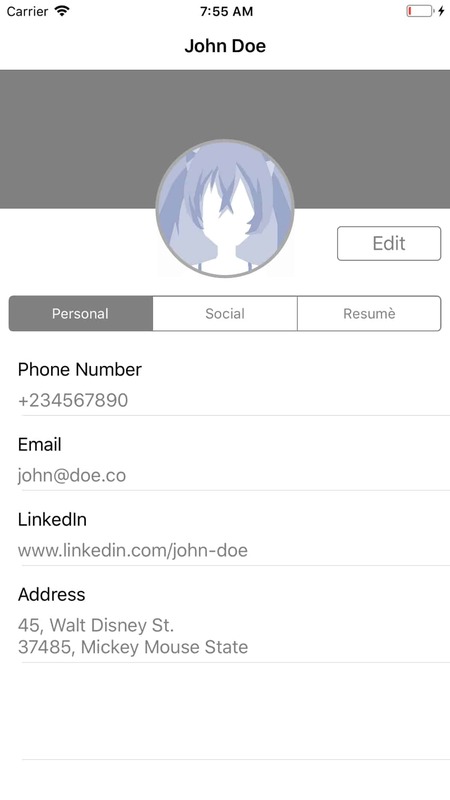 Moving on, we will now add a UITableView to present a contact’s information such as their phone number, address, etc. Once again, Xcode will complain about the class not conforming to the UITableViewDataSource protocol, which means that there are required methods in this protocol that are not defined in the class. To find out which of these methods you should implement, hold down Cmd + Control and click on the UITableViewDataSource protocol in the class’s definition, this will navigate to the protocol’s definition. There, any method that is not prefixed by the word optional must be implemented by the class conforming to that protocol. public func tableView(_ tableView: UITableView, numberOfRowsInSection section: Int) -&gt; Int — This method tells the table view how many rows we want to show. public func tableView(_ tableView: UITableView, cellForRowAt indexPath: IndexPath) -&gt; UITableViewCell — This method asks for the cell at each row. This is where we will initialize (or reuse) a cell and insert the information that we want to show to the user. For example, the first cell will display the phone number, the second cell will display the address and so on. 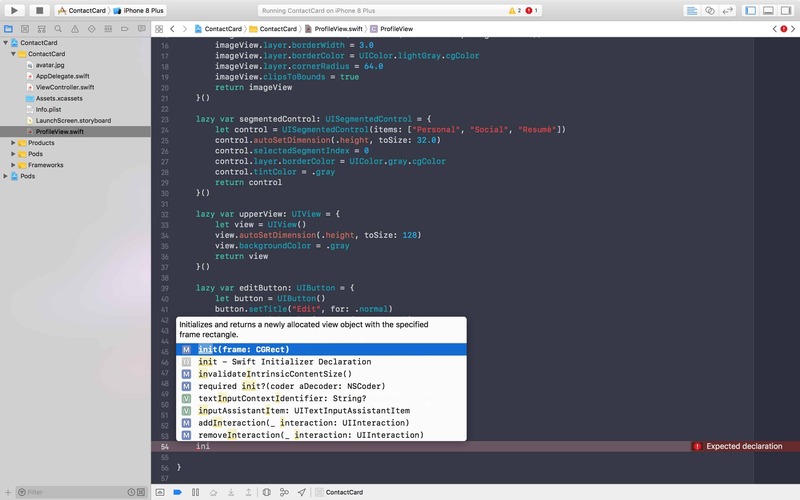 Now head back to ViewController.swift, start typing numberOfRowsInSection, and when the autocomplete appears, choose the first hit. Delete the word code and return 1 for now. Underneath this function, start typing cellForRowAt and, again, choose the first method from autocomplete. And, again, for now, return a UITableViewCell. Now, to plug in our table view inside the ProfileView, we will define a new initializer for ProfileView that takes a table view as a parameter so it can add it as a subview and setup the proper constraints for it. var tableView: UITableView! is defined so we’re not really sure that there would be one all the time. Now our ProfileView has reference to the table view and we can add it as a subview and set up the right constraints for it. The first line adds three constraints between the table view and its superview: The right, left and bottom sides of the table view are pinned to the right, left and bottom sides of the profile view. Great, now everything is in place and we can start implementing our cells. To implement a UITableViewCell, we will almost always need to subclass this class, so go ahead and right click on ContactCard folder in the Project Navigator, then New file…, then Cocoa Touch Class, then Next. Type “UITableViewCell” in the “Subclass of:” field and Xcode will autofill the class’s name with “TableViewCell”. 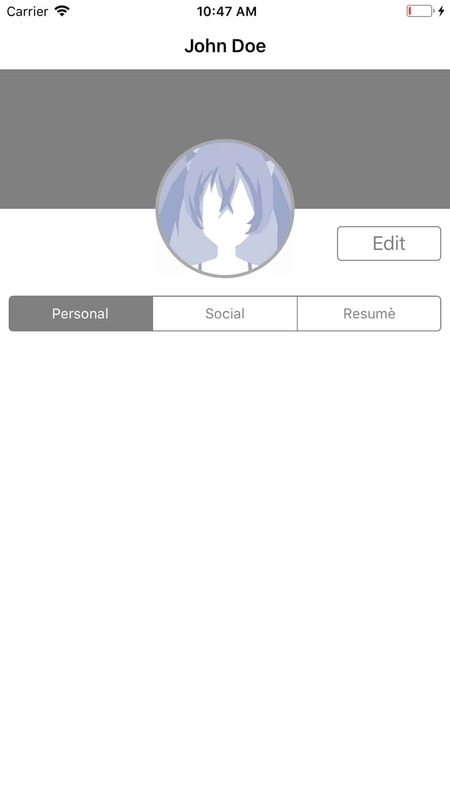 Type “ProfileView” before the autofill so the final name would be “ProfileInfoTableViewCell” then click Next and Create. Go ahead and delete the created methods as we will not need them. If you want, you can read their descriptions first to get an idea of why we wouldn’t need them right now. As we said earlier, our cell will contain basic information, which is the title of the field and its description, and so we will need labels for these. Here we start using UIEdgeInsets to set the spacings around each label. A UIEdgeInsets object can be created using the UIEdgeInsetsMake(top:, left:, bottom:, right:) method. For the titleLabel for example, we say that we want the top constraint to be four points long and the right and left to be eight. We don’t care about the bottom because we’re excluding it as we will pin it to the top of the description label. Take a minute to read and visualize the constraints in your head. Fantastic, we can now start rendering cells in our table view. Let’s head to ViewController.swift and modify the lazy initialization of our table view in order to register this cell class with the table view and set a height for each cell. We also add a constant for the cell’s reuse identifier. This identifier is used to dequeue cells from the table view when they’re being rendered. This is an optimization that can (and should) be used to help the UITableView reuse cells that were presented before in order to show new content instead of redrawing a new cell from scratch. Brilliant! And now set the numberOfRowsInSection to return 3 and run your application. There might, and most probably, will be a case where you want your different cells to have different heights according to the information inside of them, which you might not know beforehand. For this you will need your table view to accommodate their sizes automatically, and there is actually a very simple way to do so. Here, we tell the table view that the row height should have an automatically calculated value based on its content. Amazing, huh? And as a reminder of why we’re actually coding our UI, here’s a whole blog post written by our mobile team lead on why we don’t use storyboards at Instabug. Removed the main.storyboard file from your project. Created a `UIWindow` programmatically and assigned it a `rootViewController`. Created various UI elements in code, such as labels, image views, segmented controls, and table views with their cells. Embedded a `UINavigationBar` in your application. Give yourself a round of applause for that! If you have any questions or comments please don’t hesitate to contact me @alyakan.